With the U.S. Supreme Court arguments this week regarding the Affordable Health Care Act we are reading and hearing what seems like non-stop commentary on the constitutional arguments that are being made by the lawyers and questioned by the Justices. As a retired lawyer who studied constitutional law in law school nearly 50 years ago and who was a lawyer in some constitutional cases, I should be enjoying this commentary. But I am not. 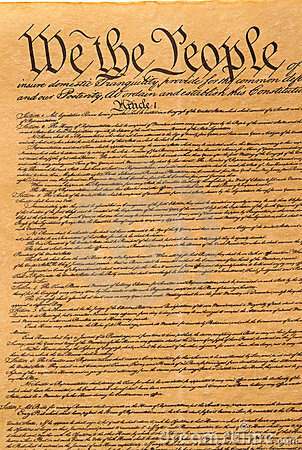 I increasingly am coming to the conclusion that the U.S. Constitution is antiquated and needs radical changes. We in the U.S. have developed a cult of worshipping the Founding Fathers as if they were demigods. Yes, they were wise in many ways, especially on the need for checks and balances in any governmental system. But if they were as wise as we often think they were, then do we really think that these men of the late 18th century would want their descendants in the early 21st century to obsess over what we think they intended in the late 18th century? Especially over terms like “due process” and “cruel and unusual punishment” that appear on their face to invite evolving meaning as circumstances change? The U.S., in my opinion, is one nation, and the national government needs to be able to address problems facing the nation, like the problem of providing affordable health care to its citizens. The so-called “individual mandate” is one way to address that problem and should be permissible. There are so many other problems that the U.S. is not addressing today. Our governmental system–our Constitution–is not working, in my opinion. I have no grand alternative constitutional schema in mind, but as previously noted, I think the U.S. Senate in particular needs radical reform if we are to retain a bicameral national legislature. To require 60% of the Senators to agree in order to do almost anything for me is outrageous. It should only be 51% for most issues. This deficiency is exacerbated by the fact that each state has two and only two Senators regardless of the state’s population. Yes, this was part of the original grand and anti-democratic compromise in the late 18th century when there were 13 states. But the expansion of the union to 50 states has made the Senate even more anti-democratic. Since I believe that it would not be wise to increase the size of the Senate to reflect the population of the states (like the allocation of seats in the U.S. House of Representatives) and that each state should continue to have two Senators in a bicameral upper house, I suggest for discussion that there be weighted voting in the Senate. Each Senator from Wyoming (the least populous state in 2010 with 564,000) would have 1 vote, for example, but each Senator from California (the most populous state in 2010 with 37,254,000) would have 66 votes (37254/564 = 66.05). This approach would produce a total Senate vote of 1,094 (total U.S. population in 2010 of 308,746,000 divided by 564,000 (population of Wyoming) = 547 x 2 = 1094). The weightings would be changed every 10 years with the new census population figures. As I suggested in a 1996 virtual constitutional convention, I would also change the term of office of members of the House of Representatives from two years to four years to coincide with the presidential election. This should result in less divided and stalemated government. I also recommend that we have direct election of the U.S. President by the national popular vote and abolish the electoral college. This would eliminate the possibility of a repeat of the outrageous Bush v. Gore decision of the U.S. Supreme Court in 2000. This new constitutional framework would permit the national legislature to enact laws regulating guns and political contributions, now virtually forbidden by the Supreme Court’s interpretations of the existing Constitution. The process of amending our current Constitution is appropriately difficult. Probably a new constitutional convention would be the most appropriate way to make the kind of changes I think should be considered and adopted. I despair, however, when I speculate of how such a convention could be held today. The U.S. Government’s participating in the preparation of the treaty, including multiparty negotiation of its terms. The President’s submitting the treaty to the U.S. Senate for its advice and consent under Article II, Section 2 (2) of the U.S. Constitution. The U.S. Senate Foreign Relations Committee’s conducting a hearing on whether the Senate should give its advice and consent to ratification of the treaty, taking a committee vote on that issue and reporting the results of the hearing and the vote to the full Senate. The U.S. Senate’s debating a resolution to grant its advice and consent to ratification of the treaty and voting by at least two-thirds of those Senators present, under Article II, Section 2 (2) of the U.S. Constitution, to do so. The President’s submitting the U.S. ratification instrument to the person designated in the treaty as the recipient of such instruments; for multilateral treaties that is usually the U.N. Secretary-General. For at least multilateral treaties, the passing of a stipulated amount of time after submission of the ratification instrument before the treaty goes into force for the U.S.
For the Convention Against Torture and Other Cruel, Inhuman or Degrading Treatment or Punishment (CAT), these procedures took 17 to 19 years and five presidencies before the U.S. had ratified the treaty and it went into force for the U.S.
1. U.S. Participation in the Preparation of the Torture Convention. As we have seen, the U.N.’s preparation of this treaty started in 1975 with its actual drafting by the U.N. Commission on Human Rights from 1978 through early 1984. During this nine-year period the U.S. was one of 53 members of that Commission and in that role participated in the treaty’s preparation. 2. U.S. Signing the Torture Convention. Although the Convention was available for signature by states immediately upon its unanimous approval by the U.N. General Assembly in December 1984, the U.S. did not sign the treaty until over three years later. During those three-plus years the U.S. Departments of State and Justice were engaged in negotiating a package of reservations and other conditions for U.S. ratification of the treaty. State advocated rapid signature; Justice, caution. Those negotiations apparently were not concluded until April 1988. The Department of State during this period also had discussions with the Senate Foreign Relations Committee staff on the subject of conditions for ratification. On April 18, 1988, John C. Whitehead, Deputy Secretary of State in the Reagan Administration, signed the Convention at the U.N. Whitehead said at signing that the treaty would be sent to the Senate for advice and consent to ratification with proposed reservations, understanding and declarations to resolve ambiguities and safeguard U.S. interests. 3. U.S. President’s Submission of the Torture Convention to the U.S. Senate. With the treaty were the Administration’s proposed reservations, understandings and declarations for such Senate advice and consent. 4. U.S. Senate Foreign Relations Committee’s Approval of the Torture Convention. The Reagan Administration’s proposed 19 reservations and other conditions for ratification were criticized by the American Bar Association, human rights groups and others. As a result, nothing happened in the Senate over this treaty during the final months of the Reagan presidency in 1988. Shortly after President George H.W. Bush took office in January 1989, he indicated that the Convention Against Torture had higher priority for ratification than any other human rights treaty. President Bush then consulted with critics of the prior Administration’s proposed conditions and subsequently submitted a substantially reduced and revised set of proposed reservations and other conditions for the Senate’s advice and consent. Finally in January 1990 the Senate Foreign Relations Committee held hearings on the treaty. The Administration presented two witnesses: Abraham Soafer, Legal Advisor, Department of State, and Mark Richard, Deputy Attorney General, Criminal Division, Department of Justice. There also were five public witnesses, including Professor David Weissbrodt of the University of Minnesota Law School. On July 19, 1990, the Committee voted, 10 to 0 (all Democratic Senators), to recommend approval of the treaty by the entire Senate with three reservations, four understandings and two declarations. The nine Republican members of the Committee were not present for that vote due to other Senate business and later complained about the lack of notice of the Committee meeting while simultaneously expressing their support for ratification of the treaty. 5. U.S. Senate’s Approval of the Torture Convention. On October 27, 1990, the Senate debated a resolution to approve the treaty. Democratic Senator Clairborne Pell of Rhode Island, the Chairman of the Foreign Relations Committee, introduced the resolution and offered four amendments that had been agreed to by the Republican minority members of the Committee headed by Senator Jesse Helms of North Carolina. These amendments were agreed to by the Senators present and voting. Thereafter a division of the Senate indicated that two-thirds of the Senators present and voting had voted in the affirmative for the resolution of ratification as amended. The resolution had the following two reservations: (i) the U.S. considered itself bound by Article 16’s ban on “cruel, inhuman or degrading treatment or punishment” only insofar as the phrase means the cruel, unusual and inhumane treatment or punishment prohibited by the U.S. Constitution; and (ii) pursuant to Article 30(2) of the treaty, the U.S. did not regard itself bound by Article 30(1) whereby states agreed to arbitrate any disputes about the treaty while reserving the U.S.’ right to agree to arbitrate a particular dispute. The resolution also had two declarations. The first stated that CAT was not self-executing, i.e., the treaty was not enforceable in U.S. courts unless there was implementing federal legislation. The second stated that the U.S. recognized the competence of the Committee Against Torture to receive and consider claims by another state that the subject state is not complying with the treaty only if the complaining state had made a similar declaration. Finally the resolution had a “proviso” that the U.S. President shall notify all present and prospective ratifying parties to the Convention, prior to depositing the instrument of ratification, that the treaty did not require or authorize U.S. legislation or other action prohibited by the U.S. Constitution as interpreted by the U.S. This proviso prompted the most discussion during the Senate debate. It was insisted upon by Senator Helms, who called it the “Sovereignty Amendment.” Democratic Senator Daniel Patrick Moynihan of New York criticized the proviso after pointing out that the U.S. had included similar language in its ratification of the Genocide Convention, but as a reservation, and that various other countries objected to it because it made the U.S. obligations uncertain. 6. U.S. Submission of Ratification Instrument to the U.N. Secretary-General. As noted above, the Senate’s advice and consent is not the final step in the process of the U.S.’ becoming a party to a treaty. For a multilateral treaty like CAT, the President has to submit U.S. ratification to the U.N. Secretary General. That did not happen during the George H.W. Bush Administration. The first President Bush said the U.S. could not do so until the U.S. had adopted “implementing legislation” that his Administration had proposed to put torturers “in the same international ‘extradite or prosecute’ regime we have for terrorists.” That legislation, however, was not adopted during that Administration. In the next Congress, however, such implementing legislation was introduced and enacted into law on April 30, 1994. This legislation added 18 U.S.C. §§ 2340, 230A, which made it a crime for a U.S. national or foreigner present in the U.S. to have committed torture outside the U.S. There is no similar federal criminal law for committing torture within the U.S.; the U.S. has deemed such a law to be unnecessary as such acts would be covered by existing state and federal criminal laws. The actual U.S. deposit of its instrument of ratification of CAT happened on October 21, 1994, and the treaty went into force for the U.S. on November 20, 1994. Four European states filed objections to some of the U.S. reservations and understandings to its ratification of the treaty. The seven to nine years it took for the U.N. to develop and approve CAT and the additional 10 years it took for the U.S. to ratify the treaty demonstrate the difficulties of achieving such a treaty, the multitude of opinions and different countries and groups that are involved and the importance of patience and persistence in the development of multilateral human rights treaties. Also significant in light of recent political developments in the U.S., there was consistent, persistent and bipartisan support in the U.S., during the period, 1975 through 1994, for policies to combat, outlaw and punish torture perpetrators. Post: The Multilateral Treaty Against Torture (Nov. 29, 2011); U.N. High Commissioner for Human Rights, Commission on Human Rights, http://www2.ohchr.org/english/bodies/chr/membership.htm. U.S. Senate, Message from the President of the United States Transmitting the Convention Against Torture, 100th Cong., 2d Sess. (S. Treaty Doc. 100-20 May 23, 1988)(containing President Ronald Reagan, Message to the Senate Transmitting the Convention Against Torture and Inhuman Treatment or Punishment (May 20, 1988) [Reagan letter] and letter, Secretary of State Schultz to President Reagan (May 10, 1988)[Schultz letter]); U.S. Senate Comm. on Foreign Relations, Report on Convention Against Torture and Other Cruel, Inhuman or Degrading Treatment or Punishment, Exec. Rep. 101-30 (101st Cong., 2d Sess. Aug. 30, 1990)[“Senate Comm. Report”]; Senate Debate on Approval of the Convention, 136 Cong. Rec. S17486-92 (101st Cong., 2d Sess. Oct. 27, 1990)(comments by Senator Pell); Weissbrodt, et al., Prospects for U.S. Ratification of the Convention Against Torture, 83 ASIL Proc 529 (1989)(comments by co-author Paul Hoffman)[“Prospects“]. Prospects (co-author James S. Reynolds discussed his involvement in the State-Justice negotiations; co-author Robert E. Dalton discussed his participation in the State-Senate Committee discussions). Reuters, U.S. Signs a U.N. Document That Seeks an End to Torture, N.Y. Times (April 19, 1988); U.S. Senate, Message from the President of the United States Transmitting the Convention Against Torture, 100th Conf., 2d Sess. (S. Treaty Doc. 100-20 May 23, 1988)[containing U.S. Statement Upon Signing Convention]. Weissbrodt at 140-41; 136 Cong. Rec. S17486-92 (101st Cong., 2d Sess. Oct. 27, 1990) (comments by Senator Pell). U.S. Senate Foreign Relations Comm., Hearings on Convention Against Torture and Other Cruel, Inhuman or Degrading Treatment or Punishment (101st Cong., 2d Sess. Jan. 30, 1990). Id. ; 136 Cong. Rec. S17486-92 (101st Cong., 2d Sess. Oct. 27, 1990). The term “reservation” in international law means “the formal declaration by a State, when signing, ratifying, or adhering to a treaty, which modifies or limits the substantive effect of one or more of the treaty provisions as between the reserving Sate and other States party to the treaty.” (14 M. Whitehead, Digest of International Law, § 7, at 137-38 (1970)[“Whitehead”].) International law has substantial limitations on a state’s use of reservations to a treaty. (Vienna Convention on the Law of Treaties, arts. 19-23.) See Weissbrodt at 128-32. Id. ; U.S. Senate, Reservations, Understandings and Declarations to U.S. Accession to CAT, 136 Cong. Rec. S17486-92 (Daily ed. Oct. 27, 1990). 136 Cong. Rec. S17486-92 (101st Cong., 2d Sess. Oct. 27, 1990). Pub. L. 103-236, §506(a), 103rd Cong., 2d Sess. (April 30, 1994). Schultz letter. U.S. federal law does make it a crime to commit certain acts with “intent to torture” in the special maritime and territorial jurisdiction of the U.S. (18 U.S.C. § 114); to commit “genocide” by “torture” or other means (18 U.S.C. § 1001);to commit “murder” in various ways, including through “a pattern or practice of . . . torture against a child or children” (18 U.S.C. § 1111); and to commit “war crimes,” one of which is “torture” (18 U.S.C. § 2441). U.N. Treaty Collection, CAT, http://treaties.un.org/Pages/ViewDetails.aspx?src=TREATY&mtdsg_no=IV-9&chapter=4&lang=en. Yesterday’s actions in the U.S. House of Representatives and Senate regarding the U.S. debt ceiling were depressing signs of the dysfunctionality of our system of government. This is not any way to go about amending our Constitution, in my opinion. Such action should be done calmly and cautiously, as suggested by the constitutional requirement for a two-thirds vote in each house for such amendments. There should be fair and open hearings in both houses of the Congress for careful consideration of the pros and cons of any proposed amendment, including this one. Such has not happened on this proposal. Although I have not studied this particular proposed amendment, I am very skeptical of the merits of the idea for two main reasons. First, I believe it would be difficult to run the federal government under such a system. Second, Keynesian economics suggests the need for the federal government to run deficits during economic recessions. Now attention turns to the U.S. Senate which yesterday immediately tabled this House bill, 59-41. World financial markets already are signaling the adverse impact of an U.S. failure to increase the debt ceiling and an U.S. default on its obligations. I pray that my analysis is wrong and that somehow by next Tuesday both houses of Congress can pass a debt-ceiling bill that President Obama can sign into law. See Post: Disgusting U.S. Political Scene (July 23, 2011). See Post: A Message for Speaker Boehner (July 29, 2011). Hulse & Pear, Senate Quickly Kills Boehner Debt Bill, N.Y. Times (July 29, 2011). See Post: The Abominable Rules of the U.S. Senate (April 6, 2011). Helderman, Senate headed for critical vote Sunday, Washington Post (July 30, 2011). The Obama Administration has adopted what it calls “an integrated approach to international criminal justice,” including the International Criminal Court. There are at least six points to this approach, the first three of which are specifically addressed to the ICC. First, the U.S. will not be seeking U.S. Senate consent to U.S. ratification of the Rome Statute. In January 2010, U.S. Ambassador at Large for War Crimes, Stephen Rapp, publicly stated that no U.S. president was likely to present the Rome Statute to the U.S. Senate for ratification in the “foreseeable future.” Rapp cited fears that U.S. officials would be unfairly prosecuted and the U.S.’s strong national court system as reasons it would be difficult to overcome opposition to ratification. He did not mention the virtual political impossibility in this Congress to obtaining the two-thirds (67) vote in the Senate that would be necessary for ratification. In addition, in March 2011, the U.S. told the U.N. Human Rights Council at the conclusion of its Universal Periodic Review of the U.S. that the U.S. did not accept the recommendations by a number of States that the U.S. ratify the Rome Statute. Second, the U.S. Administration will not be seeking statutory changes to U.S. statutes and practices that are hostile to the ICC. This conclusion emerges by implication from the absence of any such proposed legislation and from the same political calculus just mentioned. The Obama Administration, therefore, is living with the laws on the books bolstered by a January 2010 legal opinion from the Justice Department’s Office of Legal Counsel that U.S. diplomatic or “informational” support for particular ICC investigations or prosecutions would not violate U.S. law. Other hand-me-downs of past U.S. actions hostile to the ICC are the U.S.’ 102 Bilateral Immunity Agreements or “BIA”s, whereby the other countries agreed not to turn over U.S. nationals to the ICC. The last of these was concluded in 2007. There is no indication that the U.S. will seek to rescind these agreements or to negotiate new ones. Foremost for positive engagement is the U.S. participation as an observer at meetings of the ICC’s governing body, the Assembly of States Parties. The U.S. did so in November 2009, March 2010, June 2010 and December 2010 and has announced its intention to do so at the next meeting in December 2011. The June 2010 meeting was the important Review Conference that adopted an amendment to the Rome Statute with respect to the crime of aggression; this will be discussed in a future post. Immediately after the Review Conference Ambassador Rapp and State Department Legal Advisor Koh said that U.S. participation at the Review Conference “worked to protect our interest, to improve the outcome, and to bring us renewed international goodwill.” All of this reflected U.S. (a) “support for policies of accountability, international criminal justice, and ending impunity,” (b) the U.S. “policy of principled engagement with existing international institutions” and (c) ensuring that lawful uses of military force are not criminalized. At the December 2010 meeting, Ambassador Rapp emphasized three ways for the world community to help the important work of the ICC. First was protecting witnesses in cases before the ICC and in other venues from physical harm and death and from bribery attempts. Second was enforcing the ICC arrest warrants and bringing those charged to the Court to face prosecution. Third was improving national judicial systems all over the world. In this regard the U.S. endorsed the recent discussion in the Democratic Republic of the Congo about creating a “mixed chamber” of Congolese and foreign judges in its national judiciary with jurisdiction over genocide, crimes against humanity and war crimes. Another means of the U.S.’ positive engagement with the ICC is U.S. public diplomacy supporting the Court–publicly support the arrest and prosecution of those accused by the ICC’s Prosecutor and publicly criticizing those who seek to thwart such arrests. In any event, the U.S. has ceased its hostility and harsh rhetoric against the Court. Fourth, the U.S. will continue to offer financial support and advice to strengthen other national court systems, particularly in the Democratic Republic of Congo. As previously mentioned, this policy is part of the U.S. positive engagement with the ICC, but it is also part of the broader approach to international criminal justice. Fifth, the U.S. will continue to support the final work of the ad hoc criminal tribunals for Rwanda and the former Yugoslavia that were established by the U.N. Security Council with limited time periods of existence. The U.S. will do so by providing funding, by supporting their work diplomatically and politically and by providing evidence and concrete support to the prosecutors and defendants. In particular, the U.S. will work in the Security Council “to create a residual mechanism for the ad hoc tribunals that will safeguard their legacy and ensure against impunity for fugitives still at large” after those tribunals cease to exist. Ambassador Rapp also has noted that the era of the U.N.’s establishing ad hoc and short-lived tribunals like the International Criminal Tribunal for Rwanda to address specific problems was over. Only the ICC would be in business for future problems. Therefore, the U.S. needed to be positively engaged with the ICC. Sixth, the U.S. has said that it must work with countries that exercise universal jurisdiction (like Spain) when there is some relation between the country and the crime. Exactly what that means is not clear. Ambassador Rapp publicly has endorsed the principle of universal jurisdiction as another way to hold human rights violators accountable. On the other hand, as will be discussed in a future post, Spain has at least two pending criminal cases against high-level U.S. officials under Spain’s statute implementing this jurisdictional principle. Koh, The Challenges and Future of International Justice (Oct. 27, 2010), http://www.state.gov/s/l/releases/remarks/150497.htm; U.S. White House, National Security Strategy at 48 (May 2010), http://www.whitehouse.gov/sites/default/files/rss_viewer/national_security_strategy.pdf. See Post: The International Criminal Court: Introduction (April 28, 2011)(overview of structure and operation of ICC). Belczyk, US war crimes ambassador says US unlikely to join ICC in ‘forseeable future,’ Jurist (Jan. 28, 2010), http://jurist.law.pitt.edu/paperchase/2010/01/us-war-crimes-ambassador-says-us.php. AMICC, The Obama’s Administration’s Evolving Policy Toward the International Criminal Court (March 4, 2011), http://www.amicc.org/docs/ObamaPolicy.pdf; Congressional Research Service, International Criminal Court Cases in Africa: Status and Policy Issues (March 7, 2011), http://fpc.state.gov/documents/organization/158489.pdf. See Post: The International Criminal Court and the G. W. Bush Administration (May 12, 2011). U.S. White House, National Security Strategy at 48 (May 2010), http://www.whitehouse.gov/sites/default/files/rss_viewer/national_security_strategy.pdf. AMICC, Report on the Eighth Session of the Assembly of States Parties, The Hague, November 2009 http://www.amicc.org/docs/ASP8.pdf; Stephen J. Rapp, Speech to Assembly of States Parties (Nov. 19, 2009), http://www.icc-cpi.int/iccdocs/asp_docs/ASP8/Statements/ICC-ASP-ASP8-GenDeba-USA-ENG.pdf. AMICC, Report on the Resumed Eighth Session of the Assembly of States Parties, New York, March 2010 (March 31, 2010), http://www.amicc.org/docs/ASP8r.pdf; U.S. Dep’t of State, Statement by Stephen J. Rapp . . . at the Session of the Assembly of States Parties of the [ICC], (March 23, 2010), http://usun.state.gov/briefing/statements/2010/138999.htm; U.S. Dep’t of State, Statement by Harold Honju Koh . . . at the . . . Session of the Assembly of States Parties of the [ICC], (March 23, 2010), http://usun.state.gov/briefing/statements/2010/139000.htm. AMICC, Report on the Review Conference of the International Criminal Court (June 25, 2010), http://www2.icc-cpi.int/Menus/ICC/Home; http://www.amicc.org. U.S. Mission to the U.N., Statement of the U.S.A. by Ambassador Stephen Rapp to the Assembly of States Parties, (Dec. 7, 2010), http://www.amicc.org/docs/ASP_Rapp_Statement_12072010.pdf; AMICC, Report on the Ninth Session of the Assembly of States Parties, December 2010, http://www.amicc.org/docs/ASP9.pdf. U.S. Dep’t of State, U.S. Engagement with The International Criminal Court and The Outcome of The Recently Concluded Review Conference (June 15, 2010), http://www.state.gov/s/wci/us_releases/remarks/143178.htm. Id. The ICC currently is investigating and prosecuting cases from the DRC. See Post: The International Criminal Court: Investigations and Prosecutions (April 28, 2011). E.g., Statement by President Obama on the Promulgation of Kenya’s New Constitution (Aug. 27,2010), http://www.whitehouse.gov/the-press-office/2010/08/27/statement-president-obama-promulgation-kenyas-new-constitution(“I am disappointed that Kenya hosted Sudanese President Omar al-Bashir in defiance of International Criminal Court arrest warrants for war crimes, crimes against humanity, and genocide. The Government of Kenya has committed itself to full cooperation with the ICC, and we consider it important that Kenya honor its commitments to the ICC and to international justice, along with all nations that share those responsibilities”); U.N. Security Council, Press Release: Briefing Security Council on Sudan, United Nations, African Union Officials Tout Unified Strategy, Linking Peace in Darfur to Southern Sudan Referendum (June 14, 2010), (U.S. Ambassador Rice told Security Council that there was a need “to bring to justice all those responsible for crimes in Darfur, calling on Sudan to cooperate with the [ICC] and expressing deep concern at the Court’s Pretrial Chamber judges recent decision to refer the issue of Sudan’s non-cooperation to the Council”). U.N. Security Council 6491st meeting (Feb. 26, 2011). Other Council members (Bosnia & Herzogiva, Colombia, France, Germany, Libya and the U.K.) specifically commended the reference to the ICC. The other four Council members who did not join in drafting the resolution were Brazil, China, India and the Russian Federation. In the meeting, the Indian representative noted that “only” 114 of the 192 U.N. Members were parties to the Rome Statute and that five of the 15 Council members, including three permanent members (China, Russia and U.S.), were not such parties. He went on to emphasize the importance of Article 6 of the resolution’s exempting from ICC jurisdiction nationals of States like India that were not parties to the Rome Statute and its preamble’s stating that the Statute’s Article 16 allowed the Council to postpone any investigation or prosecution for 12 months. (Id.) The Brazilian representative was serving as President of the Council and, therefore, may not have participated in drafting the resolution, but she noted that Brazil was a “long-standing supporter of the integrity and universality of the Rome Statute” and expressed Brazil’s “strong reservation” about Article 6’s exemption of nationals of non-States Parties. (Id.) This suggests that the inclusion of Article 6 was the price of obtaining “yes” votes for the resolution from India, China and the Russian Federation. See Post: The International Criminal Court: Investigations and Prosecutions (April 28, 2011). U.N. Security Council 6491st meeting (Feb. 26, 2011). ___Cong. Record S1068-69 (March 1, 2011) (S. Res. 85). Koh, The Challenges and Future of International Justice (Oct. 27, 2010), http://www.state.gov/s/l/releases/remarks/150497.htm. ICC, Review Conference of the Rome Statute: Pledges (July 15, 2010), http://www2.icc-cpi.int/iccdocs/asp_docs/RC2010/RC-9-ENG-FRA-SPA.pdf. Republican state legislators are now proposing to amend the Minnesota Constitution to require a super-majority vote (60%) in the Legislature to approve most tax increases. This is a stupid idea. Have they not read about the many fiscal problems California has due to its imprudent requirement for super-majority legislative votes to approve a budget? The U.S. Senate is hamstrung due to its outdated and unconstitutional rules that impose a de facto super-majority vote (again 60%) to do almost anything. Minnesota even has difficulties passing a budget under normal rules. Our Legislature needs to operate on a simple democratic principle–the majority rules. The proposed constitutional amendment stems from the understandable, but mistaken, view that whatever a person earns is due entirely to his own efforts. On the contrary, every one of us owes whatever success one has to a multitude of other people, to a “cloud of witnesses.” Warren Buffett often remarks on his great fortune to have been born in the U.S. We are all in this together. We are our brothers and sisters’ keeper. Kazuba, Raising the bar on raising taxes, StarTribune, May 3, 2011, at B7. See Post: The Abominable Rules of the U.S. Senate (04/06/11). A slightly different version of this post was published as a letter to the editor in the StarTribune (May 7, 2011), http://www.startribune.com/opinion/letters/121416799.html?page=all&prepage=1&c=y#continue. The U.S. Senate by virtue of the “great compromise” of 1787 is inherently undemocratic with every state having two Senators regardless of population. Given the addition of more states into the Union and the changes of population since then, the Senate is even more undemocratic today. Piled on top of this institution is an arcane and even more undemocratic set of Senate rules which are not required by the Constitution and which we are hearing more about these days: cloture, reconciliation, the Byrd rule, etc. One of the spectacles in the last Congress was Senator Coburn’s “requiring” that Senator Sanders’ proposed amendment for a single payer system for health care be read aloud and thereby delaying real work by the Senate. Another in the last Congress was Senator Shelby’s “hold” on 90 or so nominees. In short, the U.S. Senate rules are a major source of Americans’ frustration with our national government. I think they are unconstitutional in that they impose a de facto super majority requirement on nearly everything, far beyond the constitutional imposition of such a requirement. The Senate needs to wake up from its pompous meanderings! Change your rules that make the Senate an abomination! At the start of this Congress there were modest changes to these Rules. But they were not enough. The Senate should operate by majority rule. The only exceptions should be when the Constitution requires a supermajority (two-thirds) vote for overriding a presidential veto or consenting to the ratification of treaties or for proposing constitutional amendments or for expelling a member.